The Gold Cup 2017 was won by the Norman family, who run 600 cows on an autumn block calving system. Katie Jones visited the farm in Pembridge, Herefordshire. For brothers Rich and Chris Norman the key to success has been taking a business approach to decisions, bringing on skilled staff, and focusing on the fundamentals of soil health to make sure they maximise the productivity of their land. The family have farmed at The Leen, Pembridge, Herefordshire, for 100 years, first as tenant farmers and then, in the 1970s, the farm was bought by their parents Tony and Barbara and established as a dairy unit. Progress over the last eight years has been rapid with the farm going from a 150-cow year-round calving herd to its present day set-up which sees 600 cows milked on an autumn block calving system. Chris explains: “Through the 1990s the herd ran at about 150-200 cows and around this time Rich and I went to university. Rich then went on to work as a farm business consultant for Andersons and I spent time working with dairy herds in New Zealand. So, on returning to the family business, the numbers were crunched and in 2005 they shifted to a tighter autumn calving period, investing in a 50-bale Milfos rotary parlour to initially push numbers up to 300 cows, which were farmed organically following conversion in 2000. The aim had always been to take numbers to 500-600 cows and another period of expansion saw youngstock brought to take the herd up to 600 by 2014. However, it soon became apparent the dairy alone was not going to fulfill the demands on the business, which had to support three families: Rich and wife Pip and children, Chris and wife Sarah and children, and Tony and Barbara. 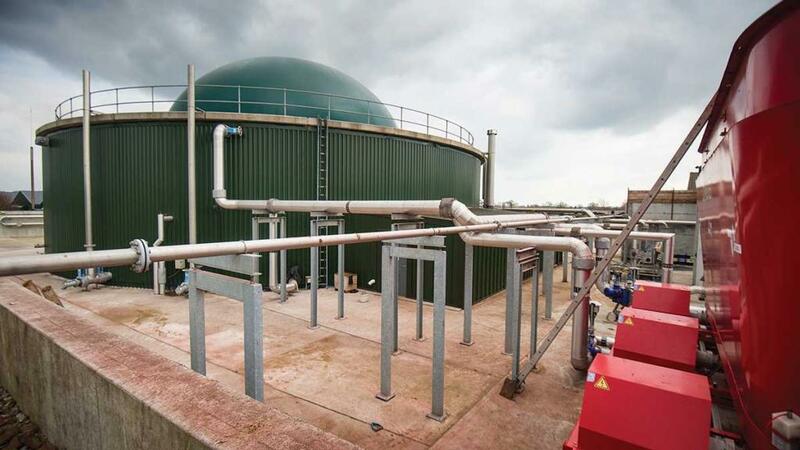 In 2013/14 a 200,000-bird broiler unit and a 500kW anaerobic digester were built. However, it also meant the farm had to come out of its organic status as the spreading of the digestate back on the farmland and the increased stocking density of the herd did not meet organic regulations. “We have used little fertiliser since and we have tried to maintain a lot of the benefits of organic production, to ensure we maintain soil health,” says Rich. The brothers are now achieving 12.5t DM/ha across the 160ha (395 acre) grazing platform, which they say is thanks to the digestate applications and improved grazing management by dairy manager Krisztian Takacs. Krisztian measures grass weekly for about 35 weeks of the year, which involves an five-mile (8km) round trip, recording data on AgriNet to produce a weekly grazing plan. The grazing area is split into 50 paddocks, all with at least two entry points and central water troughs. When converting to the block calving, about three miles (5km) of four-metre-wide tracks were laid, using gravel dug from under the farm. Cows are turned out as early as possible; this year it was the beginning of February. The light loam over gravel soils, and average annual rainfall of 711mm make it ideal for this system, but Chris says the cows have to be ‘taught’ how to graze the grass down to low residuals at the start of each grazing system. Cows are currently grazing only in the daytime between milkings, and are offered grass silage at night-time until grass growth hits the magic day when supply matches demand. As well as the lessons learned about grassland management, Chris says they also learned much about the use of antibiotics during their time as an organic herd. Conscious of the health risks of running a dairy unit, the farm is in a TB restricted area, they aim to minimise any risks by using BVD tag and test for calves at birth, blood testing them at six months old. They also vaccinate for IBR, BVD and leptospirosis. The cows are Friesian Jersey crosses, mainly a New Zealand type, along with some Irish genetics. Mating starts in late November and all cows are AI’d to a dairy bull. The aim is to achieve pregnancy rates of 88 per cent at 10 weeks. Calving starts at the beginning of September for 10 weeks and the target is to calve 80 per cent of the herd in the first six weeks. While this means a heavy workload at certain time of the year, Chris says it also gives them and their staff a focus on the task in hand. “The staff know they have a block of work to get through and they get on with it. Ensuring the right team is in place at The Leen is particularly important for the brothers. As well as Krisztian they also employ three other full-time members of staff and a student from Harper Adams University. Chris says they are keen to bring new and young people in the industry and, despite some of the staff having little or no background in dairy, the Normans have provided training on-farm, bringing them up to the skills standard they require by attending courses where needed. In fact Krisztian, who is Hungarian, came to The Leen with no experience of dairy farming, and speaking little English. The Normans have provided specific dairy training, and they now say he is a ‘key part of their success’. The team also runs on a seven-days-on, three-off rota, which Rich says allows staff time to recover and recharge. “We want them to be fresh when they come back to work, and we also want to create an environment which encourages young people into the industry.